Osama bin Laden was an American spy. Some called him ... 'Tim'. Everyone who got to observe Col Tim Osman aka "Osama bin Laden" ended up dead. The "Seal Team" is all dead, as was the plastic head that was dumped into the ocean. Khashoggi is dead. LaDexter wrote: Everyone who got to observe Col Tim Osman aka "Osama bin Laden" ended up dead. The "Seal Team" is all dead, as was the plastic head that was dumped into the ocean. Khashoggi is dead. Former Navy SEAL Robert O'Neill says he fired the fatal shots that killed Osama bin Laden, the mastermind of the 9/11 attacks, during a raid in 2011. O'Neill tells CBSN's Vladimir Duthiers what took place that night and what it took for the United States to find the notorious terrorist leader. Robert O'Neill is still alive. Khashoggi is credited as being one of the first Arab reporters to profile bin Laden, who personally invited the young journalist to Afghanistan to report on the resistance against the Soviet occupation, according to the Washington Post. In 1995, bin Laden’s family asked Khashoggi to interview Osama and get him to publicly denounce violence, in the hopes that this would pave the way for his return to Saudi Arabia and reconciliation with his family as well as the country’s ruling family, according to a chapter in The Looming Tower. Khashoggi traveled to Sudan to meet bin Laden, but bin Laden refused to back down from his new mission of fighting Americans in the Arabian Peninsula. Khashoggi reportedly pleaded with bin Laden, saying, “Osama, this is very dangerous. It is as if you are declaring war. You will give the right to the Americans to hunt for you,” and telling him that if he continued his ways, every Saudi person would renounce ties with him and refuse to even be seen with him. However, bin Laden remained steadfast about his desire to fight the Americans, and Khashoggi was forced to give up and leave Sudan the following day. He then proceeded to attack bin Laden and other Saudis who overstayed their welcome in Afghanistan, and adopted terrorism-driven beliefs that ultimately resulted in acts of violence such as the 9/11 attacks. Khashoggi was a big liar, and a Jew, which is why he worked for the WaPo. LaDexter wrote: Khashoggi was a big liar, and a Jew, which is why he worked for the WaPo. You should CEASE AND DESIST divulging secret information. You have already been reported to the Senior Executive Council of the Ruling Association of Zionist Godfathers. Some secrets should remain secret. Khashoggi may have been a liar, but he wasn't a Jew -- he was an Arab. There are plenty of photos of Osama, but it doesn't matter because he is as dead as a doornail and his body dumped in the sea in accordance with Islamic tradition. Hindsite wrote: Khashoggi may have been a liar, but he wasn't a Jew -- he was an Arab. There are plenty of photos of Osama, but it doesn't matter because he is as dead as a doornail and his body dumped in the sea in accordance with Islamic tradition. But it is a picture of the old Osama after he was kicked out of Saudi. I said Khashoggi was not Jewish. "Muammar Gaddafi, Libya’s deposed leader, ordered his ambassador to Italy killed for revealing that his mother was Jewish, Gaddafi’s chief of protocol claimed in an interview." 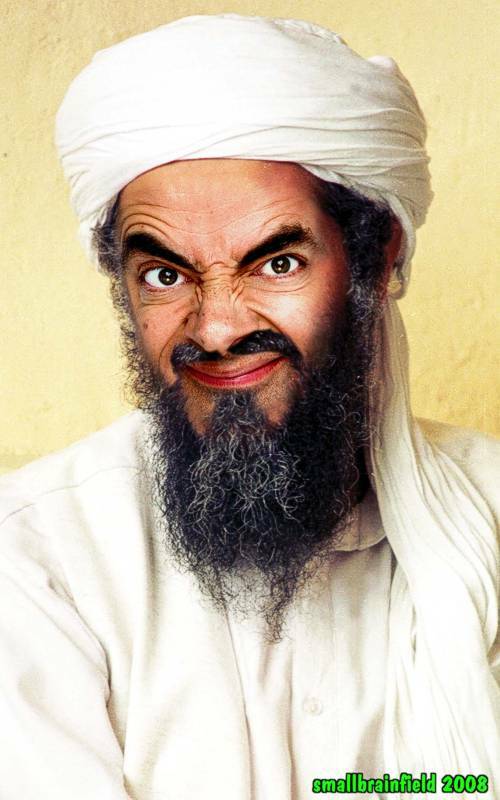 Hindsite wrote: But it is a picture of the old Osama after he was kicked out of Saudi. The REASON why the supporters of ISRAEL cannot show us ONE SINGLE PHOTO of "Osama" in Saudi is because OSAMA was NEVER THERE because OSAMA is really Col Tim Osman, Jew CIA "asset"
LaDexter wrote: The REASON why the supporters of ISRAEL cannot show us ONE SINGLE PHOTO of "Osama" in Saudi is because OSAMA was NEVER THERE because OSAMA is really Col Tim Osman, Jew CIA "asset"
Osama bin Laden was born Osama bin Mohammed bin Awad bin Laden on March 10, 1957, in Riyadh, Saudi Arabia, to construction billionaire Mohammed Awad bin Laden and Mohammed's 10th wife, Syrian-born Alia Ghanem. Osama was the seventh of 50 children born to Muhammad bin Laden, but the only child from his father's marriage to Alia Ghanem. Osama's father started his professional life in the 1930s in relative poverty, working as a porter in Jeddah, Saudi Arabia. During his time as a young laborer, Mohammed impressed the royal family with his work on their palaces, which he built at a much lower cost than any of his competitors could, and with a much greater attention to detail. By the 1960s, he had managed to land several large government contracts to build extensions on the Mecca, Medina and Al-Aqsa mosques. He became a highly influential figure in Jeddah; when the city fell on hard financial times, Mohammed used his wealth to pay all civil servants' wages for the entire kingdom for a six-month period. As a result, Mohammed bin Laden became well respected in his community. As a father, he was very strict, insisting that all his children live under one roof and observe a rigid religious and moral code. He dealt with his children, especially his sons, as if they were adults, and demanded they become confident and self-sufficient at an early age. Osama, however, barely came to know his father before his parents divorced. After his family split, Osama's mother took him to live with her new husband, Muhammad al-Attas. The couple had four children together, and Osama spent most of his childhood living with his step-siblings, and attending Al Thagher Model School—at the time the most prestigious high school in Jedda. His biological father would go on to marry two more times, until his death in a charter plane crash in September 1967. At the age of 14, Osama was recognized as an outstanding, if somewhat shy, student at Al Thagher. As a result, he received a personal invitation to join a small Islamic study group with the promise of earning extra credit. Osama, along with the sons of several prominent Jedda families, were told the group would memorize the entire Koran, a prestigious accomplishment, by the time they graduated from the institution. But the group soon lost its original focus, and during this time Osama received the beginnings of an education in some of the principles of violent jihad. The teacher who educated the children, influenced in part by a sect of Islam called The Brotherhood, began instructing his pupils in the importance of instituting a pure, Islamic law around the Arab world. Using parables with often-violent endings, their teacher explained that the most loyal observers of Islam would institute the holy word—even if it meant supporting death and destruction. By the second year of their studies, Osama and his friends had openly adopted the attitude and styles of teen Islamic activists. They preached the importance of instituting a pure Islamic law at Al Thagher; grew untrimmed beards; and wore shorter pants and wrinkled shirts in imitation of the Prophet's dress. Osama was pushed to grow up rather quickly during his time at Al Thagher. At the age of 18 he married his first cousin, 14-year-old Najwa Ghanem, who had been promised to him. Osama graduated from Al Thager in 1976, the same year his first child, a son named Abdullah, was born. He then headed to King Abdul Aziz University in Jeddah, where some say he received a degree in public administration in 1981. Others claim he received a degree in civil engineering, in an effort to join the family business. It is likely that he also received instruction in religious studies from Muḥammad Quṭb, brother of the Islamic revivalist Sayyid Quṭb, and Abdullah Azzam, a militant leader. His time at the university was key to his future role as leader of al-Qaeda, not only in influencing his radical views but also in providing him with the skill to market al-Qaeda. But Osama would have little chance to use his degree. When the Soviet Union invaded Afghanistan in 1979, Osama joined the Afghan resistance, believing it was his duty as a Muslim to fight the occupation. He relocated to Peshawar, Afghanistan, and using aid from the United States under the CIA program Operation Cyclone, he began training a mujahideen, a group of Islamic jihadists. After the Soviets withdrew from the country in 1989, Osama returned to Saudi Arabia as a hero, and the United States referred to him and his soldiers as "Freedom Fighters." Yet Osama was quickly disappointed with what he believed was a corrupt Saudi government, and his frustration with the U.S. occupation of Saudi Arabia during the Persian Gulf War led to a growing rift between Osama and his country's leaders. Bin Laden spoke publicly against the Saudi government's reliance on American troops, believing their presence profaned sacred soil. After several attempts to silence Osama, the Saudis banished the former hero. He lived in exile in Sudan beginning in 1992. By 1993, Osama had formed a secret network known as al Qaeda (Arabic for "the Base"), comprised of militant Muslims he had met while serving in Afghanistan. Soldiers were recruited for their ability to listen, their good manners, obedience, and their pledge to follow their superiors. Their goal was to take up the jihadist cause around the world, righting perceived wrongs under the accordance of pure, Islamic law. Under Osama's leadership, the group funded and began organizing global attacks worldwide. By 1994, after continued advocacy of extremist jihad, the Saudi government forced Osama to relinquish his Saudi citizenship, and confiscated his passport. His family also disowned him, cutting off his $7 million yearly stipend. Undeterred, Osama began executing his violent plans, with the goal of drawing the United States into war. His hope was that Muslims, unified by the battle, would create a single, true Islamic state. In 1996, to forward his goal, al Qaeda detonated truck bombs against U.S. occupied forces in Saudi Arabia. The next year, they claimed responsibility for killing tourists in Egypt, and in 1998 they bombed the U.S. embassies in Nairobi, Kenya, and Tanzania, killing nearly 300 people in the process. Osama's actions abroad did not go unnoticed by the Sudanese government, and he was exiled from their country in 1996. Not able to return to Saudi Arabia, Osama took refuge in Afghanistan, where he received protection from the country's ruling Taliban militia. While under the protection of the Taliban, Osama issued a series of fatwas, religious statements, which declared a holy war against the United States. Among the accusations reared at the offending country were the pillaging of natural resources in the Muslim world, and assisting the enemies of Islam. By 2001, Osama had attempted, and often successfully executed attacks on several countries using the help of Al Qaeda trained terrorists and his seemingly bottomless financial resources. On September 11, 2001, Osama would deliver his most devastating blow to the United States. A small group of Osama's Al Qaeda jihadists hijacked four commercial passenger aircraft in the United States, two of which collided into the World Trade Center towers. Another aircraft crashed into The Pentagon in Arlington, Virginia. A fourth plane was successfully retaken, and crashed in Pennsylvania. The intended target of the final aircraft was believed to be the United States Capitol. In all, the attack killed nearly 3,000 civilians. Following the September 11 attacks on the United States, the government under President George W. Bush formed a coalition that successfully overthrew the Taliban. Osama went into hiding and, for more than 10 years, he was hunted along the Afghanistan-Pakistan border. In 2004, shortly before President Bush's re-election, Osama bin Laden released a videotaped message claiming responsibility for the attacks on 9/11. Then, on May 2, 2011, President Barack Obama announced that Osama bin Laden had been killed in a terrorist compound in Abbottabad, Pakistan. 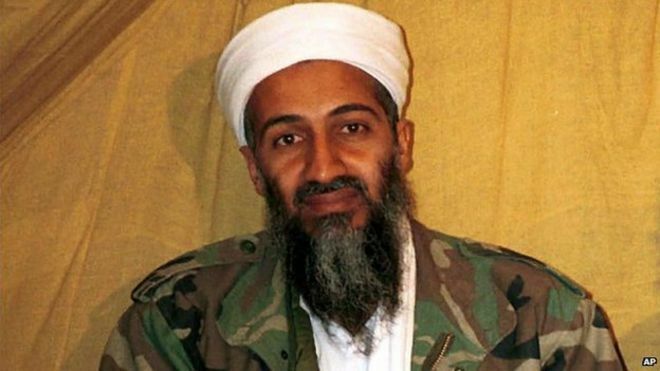 In an eight-month plan enacted by the president, and led by CIA Director Leon Panetta and American special forces, Osama was shot several times. His body was taken as evidence of his death, and DNA tests revealed that the body was, in fact, his. "For over two decades, bin Laden has been al Qaeda's leader and symbol and has continued to plot attacks against our country and our friends and our allies," President Obama said in a late-night address to the nation on the eve of Osama's death. "The death of bin Laden marks the most significant achievement to date in our nation's effort to defeat al Qaeda." He added that "his demise should be welcomed by all who believe in peace and human dignity." "Here is what we really know"
LaDexter wrote: "Here is what we really know"
We have plenty of photos of Osama when it matters. It doesn't matter if it was in Saudi or Afghanistan. It was him and you have no proof it wasn't. All you have is a conspiracy theory. There are no photos of "Osama" in Saudi, because he was never there, which is why the Saudis refused to cooperate with the FBI right after 911. HERE ARE THE REAL PHOTOS courtesy of the KGB.... the one place the CIA didn't "wipe down." "It doesn't matter if it was in Saudi or Afghanistan"
It does not matter that.... everything we were told about 911 was a TOTAL LIE.